The 5th Annual Holiday at the Dam is on Sat. Dec. 1, 2018 from 1-4 p.m. Featuring outdoor fun for the whole family. Visit and snap your picture with Santa Claus, Enjoy a Horse-drawn wagon ride with Doug Taylor of Action Entertainment, Sip hot cocoa while you roast a S'more over a warm campfire and decorate your 2019 Holiday ornament branded on the spot by Jeremy Knippel. 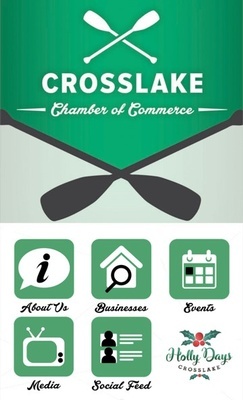 Download the Crosslake App on your mobil phone and enjoy Holly Days deals, discounts and prize drawings at Crosslake merchants and restaurants all season long! This gift drive offers less fortunate families living in our community the opportunity to receive gifts and a meal to make their holiday special. 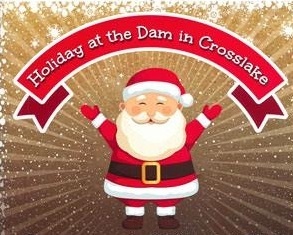 Holiday at the Dam is brought to you by Crosslake's Light Up the Dam, a 100% volunteer driven initative to adorn the Pine River Dam and Corps property with Holiday lights. Look for beautiful colored lights on the dam, shelter, pier and trees as well as a hanging wreath, Santa & his reindeer and other displays for the Holidays! In March you'll find a shamrock and in the summer months an American Flag adorns the Dam. For more information about the Light Up the Dam initative, or to make a donation please contact president Tim Shalow at nmn@crosslake.net or 218-692-3377.